Windows Vista imploded on my computer today. My lovely wife and I spent the majority of the day attempting with little success to bring Vista back to life. I was not able to finish the Illustration Friday picture I planned on completing. 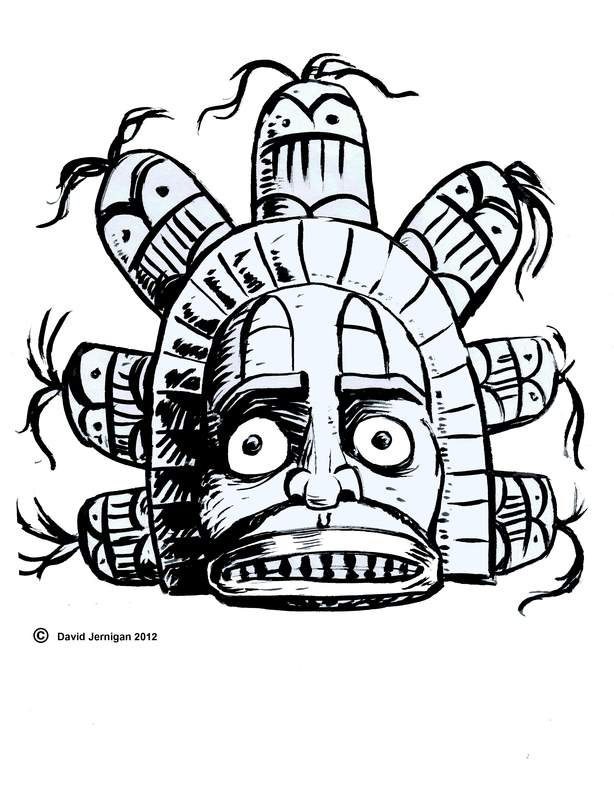 Instead, I have posted two drawings of Alaskan Indian masks I drew earlier this week during an art teacher in-service meeting. I created these drawing with a Crayola pen brush. In the first meeting of the in-service, all of us art teachers were packed into a computer lab. Several presenters tried to show us PowerPoint slides without a means to project them. I found a book about non-Western art, ensconced myself in a quite corner and sketched away. This watercolor is yet another Illustration Friday illustration. The word of the week is, “twirl”. I imagined a twirling hula girl. I was going to draw a cowboy twirling his lasso, but my mind drifted to the exquisite shores of Hawaii. The fellow at the front of the composition is rocking his ukulele. 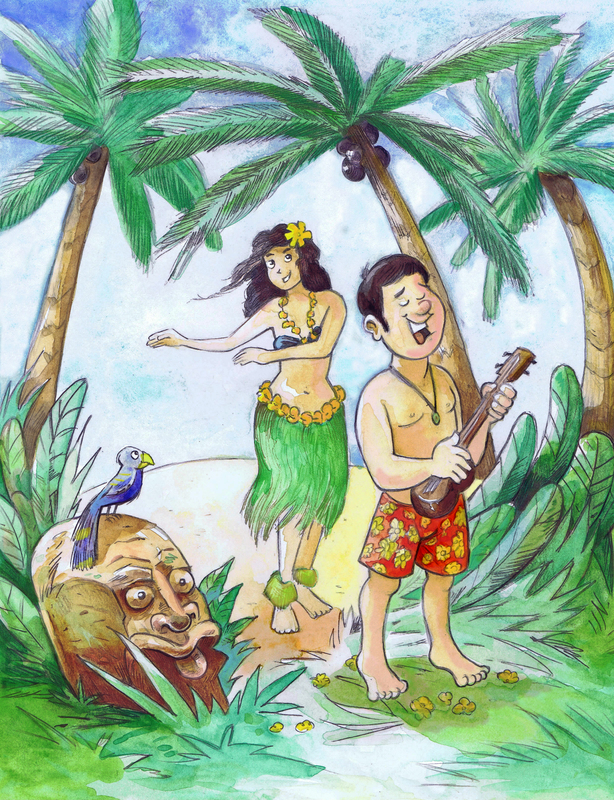 If the word, “ukulele” ever comes up I am already ready! This watercolor is yet another Illustration Friday illustration. The word of the week is, “prepare”. 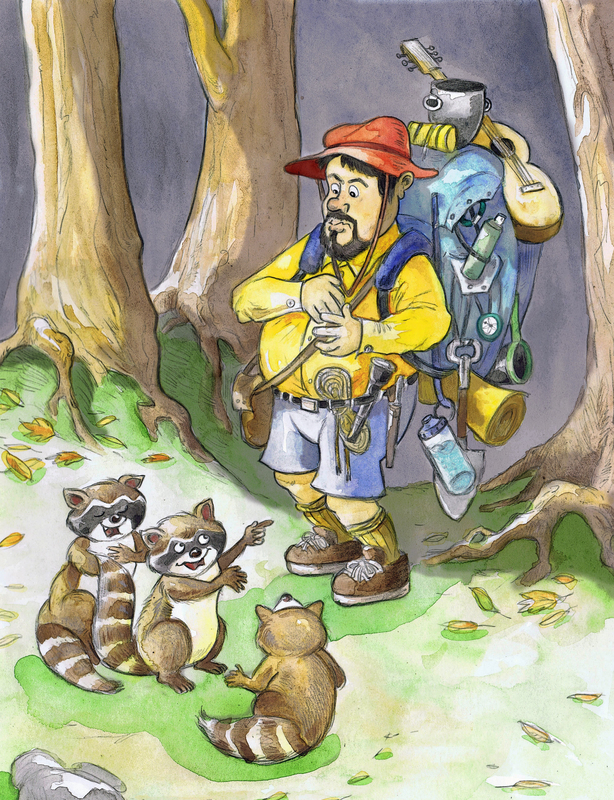 This hiker is prepared for anything except the mockery of raccoons. Honestly, who can prepare for the ridicule of raccoons? The hiker reminds me of the first hikes my brother and I made. We were a great deal over prepared. You eventually learn that you don’t need to take much when you are going on day hikes. This watercolor is yet another Illustration Friday illustration. The word of the week is, “grounded”. 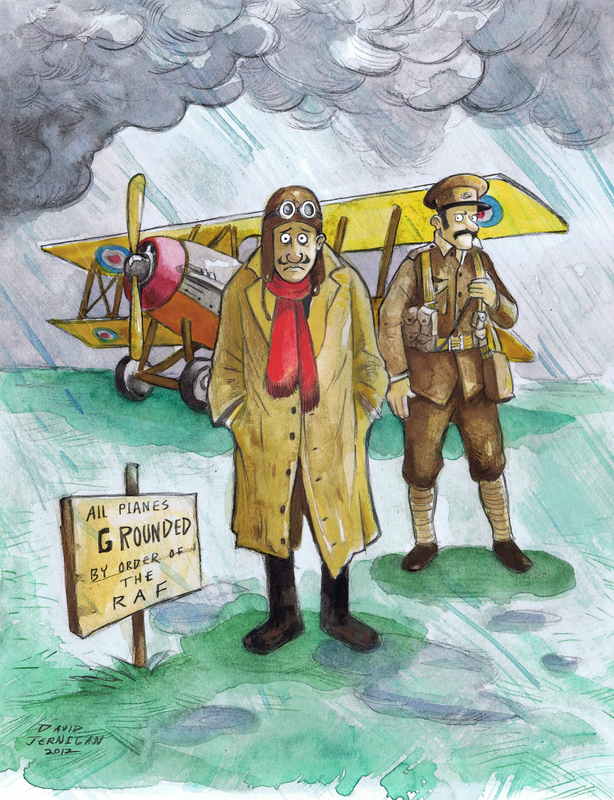 This disappointed World War One pilot is going nowhere. I contemplated using French Great War uniforms because they are made of a lovely shade of horizon blue cloth. However, I wanted a sign in English and that did not make much sense if they were soldiers in the French army. These are important things to consider when you are making a quick watercolor illustration. Here once again is another illustration for Illustration Friday. 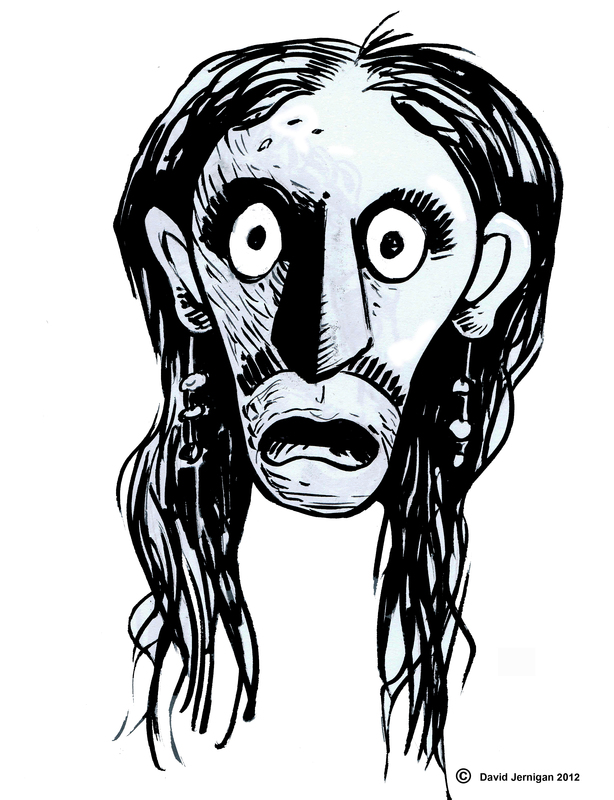 Illustration Friday is a weekly art exhibit for illustrators and artists. The site was designed to challenge participants creatively to illustrate a word of the week. The word for this week is, “Highlight”. 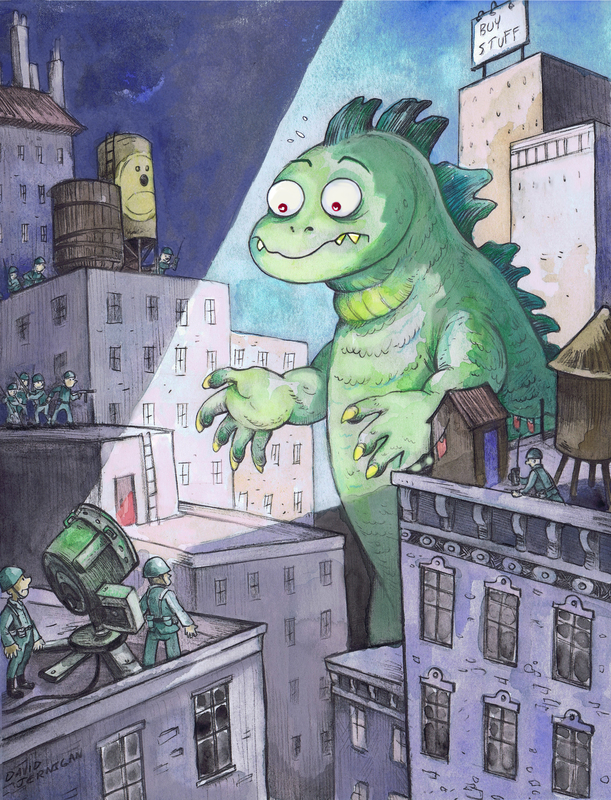 A Godzilla like monster instantly came into my mind.